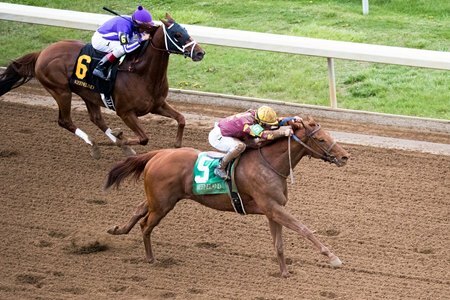 Radar Racing’s Rated R Superstar, far back early, swept past the field on the final turn then wore down favored Chip Leader April 14 to win Keeneland’s Ben Ali Stakes (G3). The 5-year-old Kodiak Kowboy gelding covered the nine furlongs in 1:49.31 and defeated Chip Leader by two lengths. It was 5 3/4 lengths back to Guest Suite in third. The Ben Ali winner, trained by Ken McPeek, was ridden by Javier Castellano. The win was the third on the day for the four-time Eclipse Award-winning jockey. Chip Leader got the early lead after a break from from post 6, and was clear of Rafting and Aurora Way as the field moved to the first turn. Chip Leader set moderate splits of :24.22 and :48.19 through a half-mile. Down the backstretch Rated R Superstar was in no hurry in the back of the field. Chip Leader remained clear on the turn (six furlongs went in 1:12.77), the field began to bunch, and Castellano steered Rated R Superstar to the far outside. Widest of all out of the turn, he collared Chip Leader inside the sixteenth pole. A final eighth in :12.16 allowed him to separate from Chip Leader in deep stretch. “I thought the six horse (favored Chip Leader) was going to be the pace to the race and it looked like the others were going to contest him at some point, whether it was early or in the middle,” McPeek said. Bred in Kentucky by Thorndale Stable and out of the Gold Case mare Wicked Wish, Rated R Superstar has won five of 24 starts. The Ben Ali was his fourth start on the season, all at Oaklawn Park. Rated R Superstar placed twice in graded stakes at 2, when he finished second in Churchill Downs’ Iroquois Stakes (G3) and third in Keeneland’s Claiborne Breeders’ Futurity (G1). He came in 11th behind champion Nyquist in the Breeders’ Cup Juvenile (G1) at Keeneland that year. At 3 he won the Carry Back Stakes (G3) at Gulfstream Park. After the race McPeek gave credit to the patience of owner Paul Parker. Rated R Superstar earned $120,000 of the $200,000 purse to boost his career earnings to $492,154. The winner paid $14.60, $5, and $3.40. Chip Leader paid $3.80 and $2.80, and Guest Suite returned $3.80.